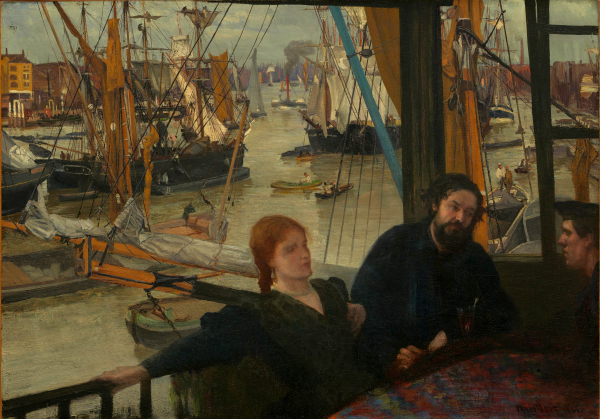 The charming, beautiful and even, at times, profound exhibition Whistler and the Thames, the highlight of the early winter season at the Dulwich Picture Gallery, is enchanting and absorbing on several counts: the interest of the contents in terms of aesthetics and of its views of the beauties of the working river, even in some of its subtly sordid aspects, and for subliminal questions about nationality and identity. Was he? Yes his parentage was American, and Whistler was born in the United States. His boyhood was spent in St Petersburg where he attended his first art lessons at the St Petersburg Imperial Academy. His father until his premature death was a leading railroad engineer in the employ of the Czar. He also visited his half sister Deborah, a gifted musician married to the surgeon and amateur artist – who became a gifted printmaker – Francis Seymour Haden, in England. Returning to America, Whistler enrolled at the West Point Academy, America’s Sandhurst, where his failures in scientific subjects meant his studies were terminated, and he was briefly employed in the agency mapping the American coastline. Whistler left America permanently – he never returned – to study art in Paris. And from there to make his life in London, with trips to South America, surprisingly, and Holland, and above all Venice – where he created a superb set of etchings, among his masterpieces, financed by the Fine Art Society. Bilingual in French, he also spent much time in Paris, first as an art student, and when old, restless and deeply distressed by the premature death of his beloved wife, to Paris again on visits. But London was his home, even though in his last years he sometimes referred to America as home. Yet he never revisited his native country, in spite of the pleas of friends, artists, collectors and patrons. Sir John Holker, acting for John Ruskin: the labour of two days is that for which you ask for two hundred guineas? Whistler: No, I ask it for the knowledge I have gained in the work of a lifetime. It has been splendidly characterised as the first modern argument about modern art. 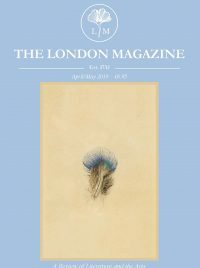 Certainly the individual aesthetic, the sense that the artist was open eyed and open to many influences, especially in Whistler’s case (rather like Vincent van Gogh, among many other contemporaries) to an oriental aesthetic, from prints to ceramics, was consciously paramount. As Whistler himself commented, ‘Nature is very nearly right, to such an extent, even, that it might almost be said that Nature is usually wrong; that is to say, the condition of things that shall bring about the perfection of harmony worthy of a picture is rare, and not common at all. Nature contains the elements, in colour and form, of all pictures, as the keyboard contains the notes of all music …’ Nature – reality – is both subject and inspiration, but the artist is the composer. Whistler was of course profoundly interested in and receptive to music. His father had played both the piano and the flute. His older half-sister Deborah was a gifted pianist and played the harp as well, and had given private performances with her father in St Petersburg. In an early masterpiece, At the Piano, 1858-9, Whistler shows his sister playing in her London drawing room, watched attentively by her daughter Annie. He was to name his paintings symphonies, nocturnes and arrangements. He declared about his best known painting, Arrangement in Grey and Black No 1: The Artist’s Mother (1871), the first painting of his to enter a public collection, the Louvre in Paris (now in the Musée d’Orsay), that the identity of the subject did not matter. The first painting of Whistler’s to enter a British public collection was in fact the second such title: Arrangement in Grey and Black: Thomas Carlyle, 1872-3, a masterpiece which is in Kelvingrove, Glasgow. Carlyle, the great historian, was a neighbour, the resident genius of Chelsea, and had seen the portrait of Mrs Whistler, and admired it. Whistler was a master of the portrait, as well as the landscape, the hubbub of the city and also in a myriad of ways shore and sea, riverside and river. The current compilation is piquant precisely because the detail of the subject matter is as absorbing as the highly individual impressions, atmospheric and absorbing, conveyed by Whistler. It is a convincing visualisation of the Thames in the later nineteenth century. His methods and techniques are various, but all at the service of his subject in an extraordinary range of interpretations and subjects both generalised and specific. London had fog, mist, cloud and pollution from coal fires, unhealthy of course but mysteriously beautiful and the river was full of activities, shipping on the river, pub life, lowlife, festivities in the river pleasure gardens, strolling on the embankment. He declared himself the painter of the notorious London fogs, the pea-soupers which meant that it could be darkness at noon. As great a portrait painter as he was, throughout his life Whistler was transfixed by sea, river and sky as subjects. On a quixotic trip to Chile, Whistler painted the bombardment of Valparaiso by Spanish ships, but for example titled one atmospheric painting Crepuscule in Flesh Colour and Green (1866). Whistler was to frequently paint seascapes in France, and indeed Holland, and during his stay in Venice produced a series of prints and pastels which evoke the astonishing light of canals, waterways and lagoon. The watery light of Venice captivated the artist, as did the elaborate architecture of palazzo and canal gate. The Seine was not a subject; Paris was not as polluted and fog-ridden as London, nor is the Seine tidal. In several exceptional lithographs his love for his wife and his love of the Thames are subtly related. For three months in 1896 Whistler and his wife Beatrix, who was dying of cancer, lived (as had Monet) on the top floor of the Savoy. From his room he depicted the river view in half a dozen prints. And he also made two tenderly affectionate, loving portraits. In The Siesta, Beatrix resting in her bed at the Savoy gazes out with a quiet intensity, grave and loving. A book lies discarded on the counterpane. The profound attachment between husband and wife is almost palpable. In By the Balcony, Beatrix’s bed is before the open window, the view towards Waterloo Bridge just a whisper of lines. She tentatively grasps the window-frame as she gazes outward. Her frailty is evident, and she is resting. In the most poignant touching image of his entire career, the river is still softly present. copyright of NATIONAL GALLERY OF ART, WASHINGTON D.C.